We had a stormy week. 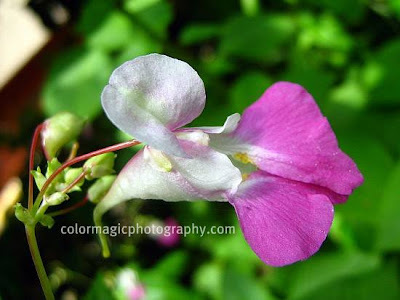 I think I found some of those flowers around our subdivision and now I know its name! I didn't recognize them as impatients, but when you called them touch-me-nots, then I could see the resemblance to the orange ones we have here!! Funny how the shape is the same, and the colour so different! They look very nice. do you know why they are called "touch-me-not"? Do they have a sting or something poisonous perhaps? Hi Maia, as usual, great macro.Have a great weekend. Lovely pink. They look so delicate. I'm glad to have rejoined you here. They are beautiful! Have a lovely weekend. I'm new this week and lovin' what you've created. I've never seen this particular variety of impatiens. Really quite stunning. Maia, thanks for sharing about this plant. 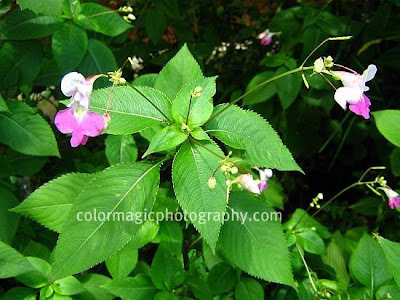 I would never have guessed it was a kind of impatiens. Beautiful photos, as always. don't think I have seen this before. My snowdrops are in full bloom. My grass cutter cut the clump off and I was worried, but the flowers came out. That is a beautiful variety of impatiens, I really like the bloom. Sorry I missed MFS this past weekend, things just got too hectic. I will be back this coming week.